Last week I hit a BIG milestone…I turned 3-0!!! We only turn 30 once, right, so why not celebrate just as COLOSSAL?! I wanted to go somewhere I’d never been that was extremely unique and different. The first place that came to mind was a restaurant I saw on the Travel Channel, while watching Man vs. Food, called Big Lou’s Pizza. This pizza shop is famous for their deliciously ENORMOUS pizzas, the most popular being a whopping 42 inches!!! This pizza feeds 18, which was perfect because 17 of my closest friends came to celebrate BIG with me! When the pizza arrived, I was shocked by its size, GIGANTIC!! We ordered 3/4 of the pizza with pepperoni and jalapeño and the remaining quarter mushroom and jalapeño, to accommodate my vegetarian friends. We had a blast! 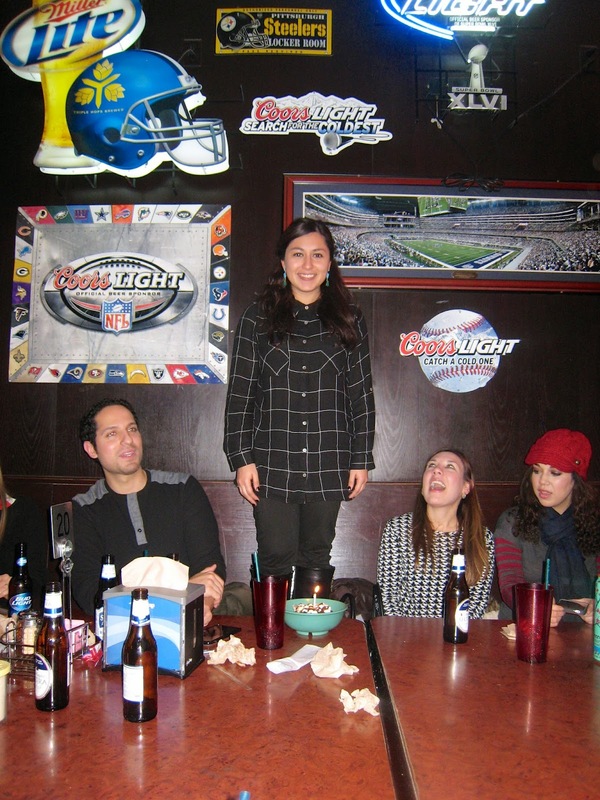 To wrap up the night, in a MASSIVE way, I was made to stand on a chair, while all of my friends sang Happy Birthday to me. What a GREAT birthday!! !